My FlexRadio Systems Flex-6700 is radio #11, and arrived as part of their public Beta Program – the SmartSDR Preview Program – third week of June 2013. Software at the time was SmartSDR Preview Edition 0.12.x which was fairly basic. As I write it is October 2013 and the radio is now on full production release SmartSDR 1.0.0, the Preview program having wrapped up after four-five updates, each which transformed my Flex-6700. Most importantly SmartSDR 1.0 is the first step on a road map of quarterly updates, each which will bring major additional features to my Flex-6700. By download I’ve got a “New Radio” arriving every three months!! It was an absolute privilege to participate and when the technical discussions were outside of my knowledge zone, to be an insider spectator during the forging of the earliest widespread release of SmartSDR into a form that could stand as production. At times I was a bit embarrassed when fellow participants forgot that the Preview Edition software was a work-in-progress. Those who had the big picture view were amazing in the amount of testing, troubleshooting and “what if” challenging they gave a radio-in-progress. I personally learned a lot about our hobby by being part of the process. Each 2 weeks, provided candidate software passed small group quality checks, an update of “SmartSDR Preview Edition” rolled out. In a few cases the candidate software did not pass FlexRadio Systems small group quality checks and therefore was not released to the Preview Edition group. Some very silly grumbling from some of the Preview Group who moaned they didn’t get an update – as if FlexRadio Systems would ever knowingly distribute software that failed quality checks? In all honesty there were members of the Preview Group who should have not asked to have their radio shipped until the features they felt critical were completed. A few of the Preview Group struggled with “The Radio is in The Software” capability of the next SmartSDR Preview Edition to transform their radio to the next level. It is worth remembering to check either the SmartSDR software level being reviewed or the date any SmartSDR commentary you read on the internet given the massive improvement achieved in the SmartSDR Preview process and planned with the roadmap taking SmartSDR v 1.0 forward. Added along the way added has been SmartSDR CAT. SmartSDR CAT can replace other virtual serial port driver software packages, or serve as the Flex-6000 SmartSDR aware additional virtual serial port driver software package. This add-on is slick, making the virtual serial port driver issue very simple. While it comes bundled with SmartSDR it does require a manual Windows Program Uninstall and then Installation when SmartSDR CAT is upgraded. This separate Manual Uninstall/Install is a Microsoft Windows requirement and may be with us on Windows platform clients for some time. DDUTIL hooks SmartSDR CAT and SmartSDR into an environment your other radio software and hardware will recognize. In my shack DDUTIL integrates an Expert Amp, Palstar Autotuner, a Green Heron rotor control, and several software packages to my Flex-6700. Okay, here is where the rubber hits the road – with the first public release of the SmartSDR software my Flex-6700 is already equal to or better than any other amateur transceiver on the market. At least any that I have had the pleasure of spend time operating. There is a remarkably easy-to-listen-to nature of the received audio and it is a true DX hound. The receiver is a very good match to the Tennadyne T-8 Log Periodic antenna, making the most of the no-tune nature of the Log. I’ve been able to leave the Expert Amp on half or lower power with the same effectiveness. All in all it is a ready to rock-n-roll SSB DX rig. Similar reports speak of sound CW performance. Laggard at this time is the Digital Mode capabilities which are sound provided an external interface and computer sound card audio routing like a black-box transceiver is used, as the full digital implementation is further down the road map. Reports are solid on those using a Flex-6000 for digital in the old school setup. The ability to pop open panadapters on additional bands and drop receivers to monitor other band segments/bands, is awesome. The features presently released work quite well, with only a few glitches being reported at this stage. Now what is cool is about every 90 days a new updated version of SmartSDR will be out. Obviously the road map is just a scratch at the surface of unleashing the Flex-6000. SmartSDR is just one of several possible GUIs and non-GUI interfaces. FlexRadio Systems has hinted about add-in modules to Contest, work on other client platforms, link/combine several Flex-6000s, do wide-area diversity and things as users we’ve not likely even thought of. One has to remember that FlexRadio Systems is building on years of experience with professional grade products, and is distilling down the best of that experience to an amateur radio products. You can see my pre-launch series of articles for some of the possibilities I had thought up. 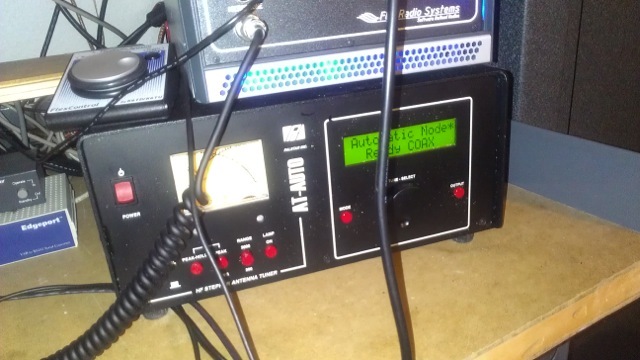 A micro-DXpedition/Mobile ready radio as the radio’s present interfaces are all PC based. A prepper’s primary back-up radio. Ready for the visual impaired (though alternate UI’s are possible). A single-box shack – you need the PC to access the radio. A likely radio for an “Internet Free” QTH unless arrangements were made to get physical media with various upgrades. Simple Plug-n-Play – while SmartSDR is easy to install, if an operator would have trouble installing Microsoft Office they will need help with a Flex-6000. Like any new technology the Flex-6000 and SmartSDR have attracted naysayers – the vast majority who have an agenda rather than first hand observations to share. Again it is important to date reviews/comments against the SmartSDR Preview Edition version or production roadmap version, as the comments may be of historical interest only given the rapid evolution of the radio. The Flex-6000 is seriously challenging to conceptualize as the hardware/software combination is layered, complex, exceptionally simple at the User Interface while immensely powerful under the hood, elegant, evolving, and vacates concepts like VFO-A/VFO-B architecture. This is not a comfortable mindset for some users, as their personal concepts of what an amateur radio should be is something different than this brave new world of the Flex-6000. A few SmartSDR Preview Edition participants sold their radios to other hams, or simply put them on the shelf waiting until a general release with the feature they hold dear is available. The latest generation of technology always stretches the operator. The “Game Changer” of the Flex-6000 series is here, to stay. That doesn’t mean that IC-7800’s, or FT-1000MPs, or TR7s, or Gold Dust Twins – or any other layer of prior technology – is somehow anything less. 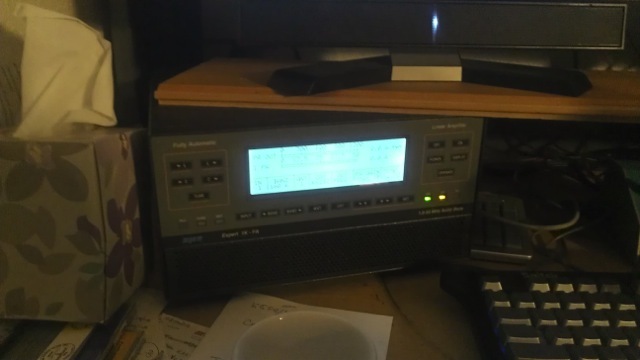 I have no intention of suddenly selling my favorite older radios because of the Flex-6000 revolution. But I do understand that the new cutting edge has been pushed way ahead – the boundaries of the hobby have suddenly expanded. And I am thrilled to be a participant with radio #11 of the new wave of Flex-6000 technology. What could be any more fun?! Sometimes the bands can leave a person simply puzzled! Working the regional 160m net was a chore, with S9+20 roaring noise. It was only that I was having configuration troubles after upgrading software – much of which I may have avoided by more carefully reading the manuals and making better notes during upgrade setup – that I stuck in the station fussing with settings. Much of the time I was wrestling with Audio Gremlins and Port Control Software configuration. 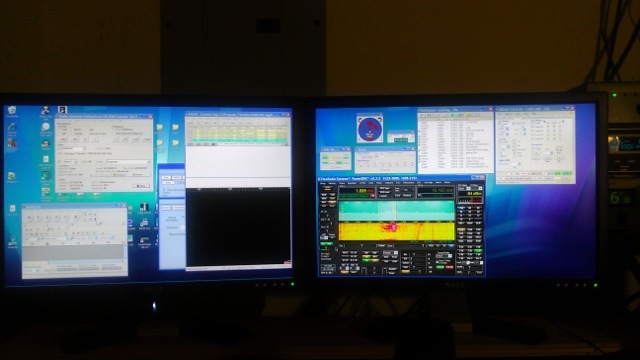 In the midst of messing, some listening & some DX Cluster watching suggested that 15m and 17m were moderate to long. 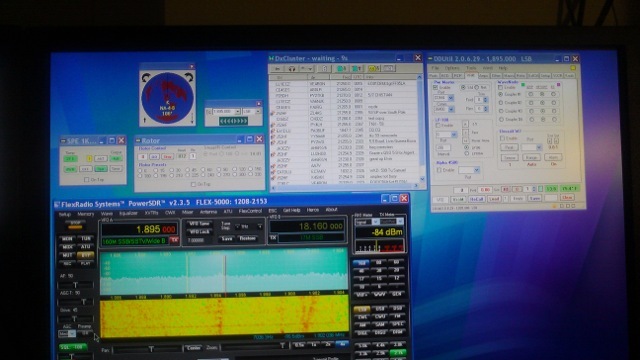 On Software the two recent station changes – upgrade of PowerSDR to the latest v2.3.5 and use of DDUtil integration software – the PowerSDR upgrade has been the most frustrating. It would seem that my cheat sheet of “good settings” from the prior version is not going to work, and many of the Audio enhancements are suddenly so sensitive that I have to either turn them off or cut them back to less than 25% of their prior levels. Audio settings are important for me, as my natural voice is not a good DX voice, being too baritone and resonant. With the Flex-Radio I sidelined my external processing audio gear and use the various software equalizers, compression options and other enhancements to create a competitive DX Voice. Basically I filter and process my voice to a broadcast sound that is higher in pitch focus and has a more precise audio core. One really weird part of doing the monitor of self listening technique is the slight delays in the system – they are minuscule though you do end up talking slower as you naturally wait to hear the end of your phonetics – “kilo niner zulu whiskey” slows down into “keyyylooow nighnnneer zoooolooooo whhhhissskeeee” as instinct creates a feedback cadence slowdown. Sounded link an Andy Warhol painting in audio! I didn’t work but heard 9N1AA (Nepal) and an Indian station – the pileups were huge and I didn’t want to add to the din with questionable audio & weak copy on receive. As I didn’t have Thailand or Cambodia in the log under my own call, it was a real pleasure to find that my “Mr Fixit” session had a bonus of a couple new DX Entities!